The classic and historic ambiance of our wrought iron fences makes them some of our most popular choice to date. With beautiful designs and new technology in the manufacturing process, our customers have learned the long lasting beauty of the traditional sleek look of the wrought iron fence. We use heavy gauge galvanized steel that are given a several step coating process. The pickets are attached using grooved rails and clips system that involves no welding. Also all of our iron fences have been applied with a powder coating process. This powder coating process includes a several step cleaning process and has a generously applied corrosion resistant epoxy powder primer. In other words this process makes our iron fences highly rust resistant. Not only are they built to last but with all this protection, they also come with a 1 year product warranty, that protects against peeling, chipping, cracking, or blistering. 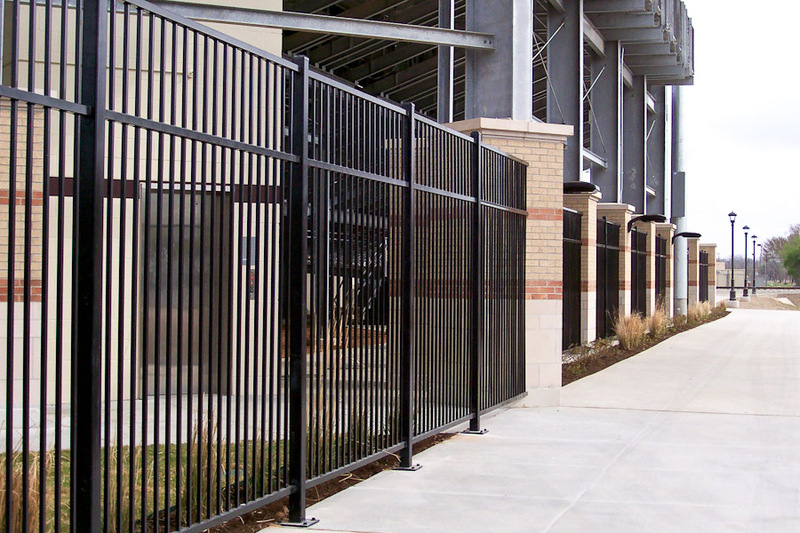 The wrought iron fence is available for residential and commercial use. If your fence need is for a residents such as a gate or small custom wrought iron fence, we can customize a wrought iron fence that will meet your specific need. You can trust that our designs will make your location standout. Your custom wrought iron fence will accomplish your containment, privacy, and safety needs while delivering head turning results. Fill our our form and receive a free quote and fast savings!